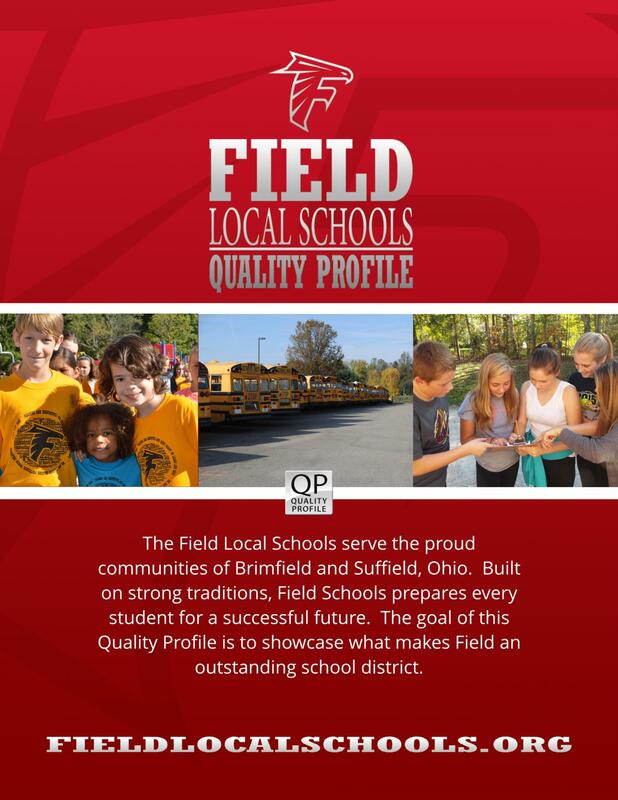 The district serves Brimfield and Suffield Townships in Northeastern Ohio. In addition to having outstanding college preparatory and general courses of study, Field High School is affiliated with the Maplewood Career Center, which offers a variety of vocational programs and Tech Prep courses of study. Approximately 84 Field HS students attend the Career Center. Seventy-five percent of FHS graduates in the Class of 2017 continued their education at two-year or four-year colleges and universities. Field Local Schools offers services for Gifted students, English Language Learners and a wide-range of other individual student needs. The district promotes and supports high achievement with technology, including a cutting-edge 3-D Computer Lab, Hybrid Courses, MS Coding Classes, and technology integration at all levels of instruction. Falcon Athletes compete in the Portage Trail Conference. In 2016-2017, Varsity Boys' Baseball, Varsity Boys' Golf and Varsity Girls' Soccer all won PTC Championship titles. The strong support of PTA's and PTO's (parent-teacher organizations), Athletic & Band Boosters, surrounding businesses, and local governments enhance the lives of our students. There are many amenities within, and surrounding the district. Mogadore Reservoir and Wingfoot Lake State Park offer endless outdoor recreation possibilities. Retail shopping and dining are expanding within the district while the communities still maintain their rural feel. The Field Local School District is conveniently located near Kent State University & the University of Akron, offering a wide-variety of educational partnerships for our students. The local business community continues to grow because of a ready supply of workers and access to a major interstate.